Having allocated £40m of its budget on the road to nowhere – the Bexhill/Hastings Link Road – East Sussex County Council is now gearing up to saving £60m over the next three years by cutting services used by the most vulnerable in the county. The fact that it is sitting on reserves of over £400m make the decision that they are preparing to take at the next meeting of the full Council all the more scandalous. Under the budget proposals cooked up by the Council’s cabinet committee, children with special needs, disabled people, victims of domestic violence, older people, young people at risk, young parents and the homeless will all have services reduced or cut. If you look at the make-up of the cabinet – white, middle-class and middle-aged down to a man (and I mean that literally; no women, let alone a young person or someone from a different background) – it does go some way to explaining how a decision that requires such a lack of empathy could be made. That, and the fact that over the past two years it has been made clear from the very top: it is the same old nasty Tory party attacking the weakest targets they can find. 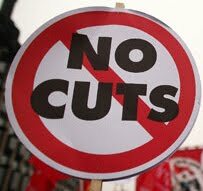 However, Lewes Stop the Cuts, a coalition of individuals, trade unions, charities, students and community groups, is committed to fighting these cuts to public services. A lobby of the next Council meeting is being held on Tuesday 12th February. Any individuals or organisations who can support this lobby should meet at the main entrance to County Hall, Lewes from 9am onwards to let the councillors know that those they think are the weakest are - together - the strongest.